The WIRSYS1 from Williams Sound is a two-channel wireless listening system ideal for use in courtrooms. The system consists of a MOD232 infra-red modulator, a WIRTX9 infra-red emitter, and four WIRRX12-4N bodypack receivers. The MOD232 modulator can accept two mic or line-level audio inputs simultaneously via the XLR/TRS combo input jacks. It uses a Baseband cable connection to transmit the audio over one of four selectable frequencies to the WIRTX9 emitter. The modulator also has RCA line outputs for connecting to monitors or recorders. Additional modulators may be daisy-chained as well. The emitter receives the audio signals and divides its power equally among them. In the case of this system, two channels will be received and sent to a coverage area of approximately 18,000 square feet. If an additional modulator (sold separately) were connected, the emitter would receive four channels, and a coverage area of approximately 11,000 feet could be maintained. The emitter is wall or ceiling-mounted, and sends the audio from the modulator to the WIRRX12-4N receivers. 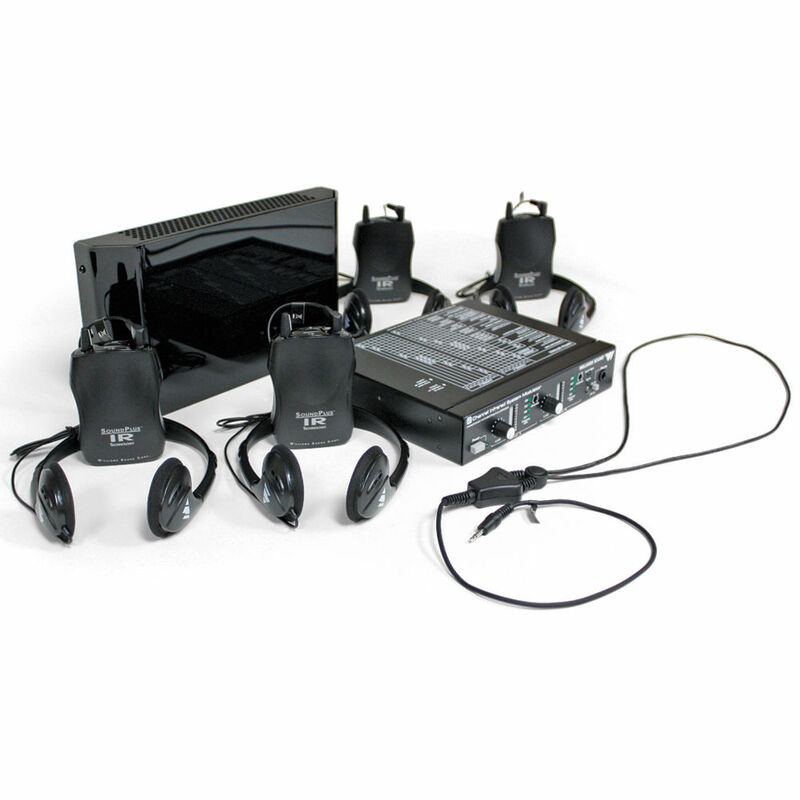 The receivers are compact bodypacks that are easily held or worn around the neck on a lanyard. They offer a four-way channel selector to match the frequency of the other system components, and a large, easy-to-use volume control. The standard 3.5mm headphone jack accepts the included fold-flat headphones as well as the included neckloop, which accommodates a user with a T-coil-equipped hearing aid. The receivers each operate for up to 60 hours on standard AA batteries. Signal to Noise Ratio 60dB Min.